Jason's awesome post at GORUCK about site casing. His post explains in great detail why this is important and how to approach it. To case a site is to carefully inspect a location to determine its operational use. That’s how the intelligence community defines it anyway. 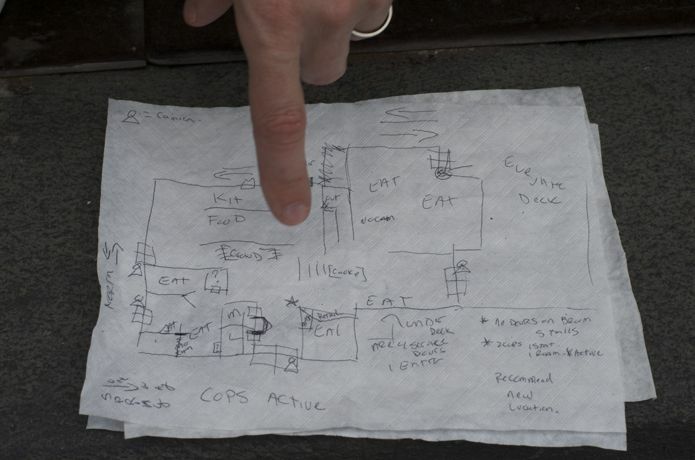 Spies use their case sites for things like sensitive meetings, car pick-ups, brief encounters, dead drops, timing stops on a surveillance detection route (SDR), etc. Basically, casing is one of the foundations for all intelligence work. As GORUCK has evolved, we’ve gotten a lot of requests for our Cadre to teach more of what we’ve learned in training and practiced in hostile environments around the world. So we are. We’ve added a few Cadre with intelligence backgrounds – who says the CIA can’t play with Special Forces? – and we’re patterning some teaching scenarios after actual spy games. This came about because of several factors, the main one being that our Good Livin’ events – like the Challenge – are all physical events. While we would love for everyone to do them, we can also be effective and have fun teaching teamwork, leadership, and communication (TLC) in a completely non-physical environment, accessible to all. Solutions events are based on this model and Trek is 3 days of this kind of stuff within a CIA meets Special Forces type live scenario. As I’ll explain, the lessons taught do not exist in a vacuum. Applications to your daily life, both personal and professional, are significant. Thanks Jason, you just made my day! It now brings dark memories of him and Cadre Lou busting my six at Trek.